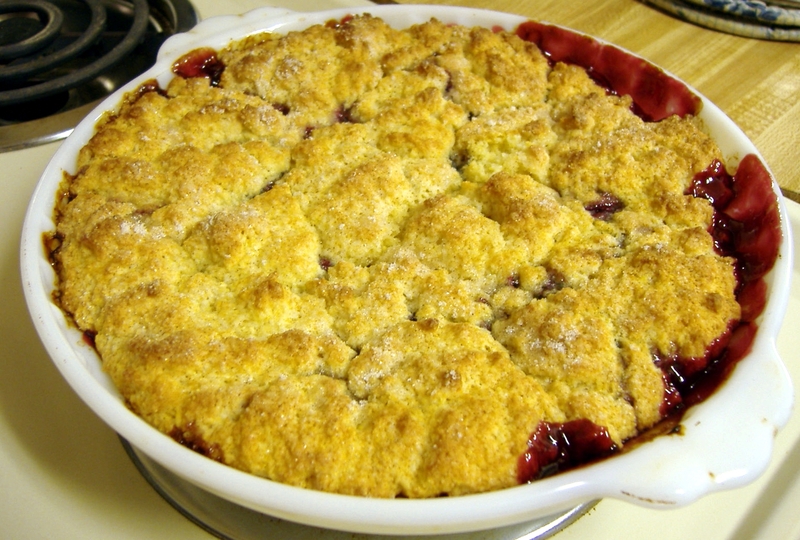 Now this is a cobbler! Zo and I put our heads together and came up with this cobbler about 2 years ago. I do not know why it has taken me so long to get it up here! It is one of those lost recipes that I stumble upon here and there. But hey no one accused us at Cooking for Zo of being organized! This tart but sweet cobbler combines both Zo and my favorite cobblers into one tasty mouthful of heaven! Try it today but try not to eat it all! In a large saucepan combine filling ingredients and cook over medium heat, stirring constantly until bubbling and thickened (7-10 min.) Pour into an 8-inch square baking dish (we used a deep glass pie dish). In a large mixing bowl, stir together flour, sugars, baking powder, and cinnamon. Cut in butter until it is crumbly. Mix together egg and milk and then gently combine with the flour mixture until just combined. Drop dollops of dough mixture over dilling with a tablespoon. Place baking dish on the middle oven rack and bake for 25-30 minutes or until the topping is browned and the filling is bubbling. Remove from oven and serve as soon as it has cooled off enough to handle! Enjoy!